Today I’m going to share with you the basics of video production. The basics are roughly 4 elements that need to be correct for an effective video. These elements remain the same whether you are making a video for yourself, your friends or doing an instructional video for a company, organization or YouTube. I am talking about the very basics here, I know there is a lot of progress with video production and equipment but lets break it down to the VERY BASICS. Lets start with the CAMERA. There has been so much advancement in camera technology in the last 10 years it is quite incredible. 15 years ago when I was studying Video Technology we had to book the cameras when a project was required from us. Back then the cameras were S-VHS Panasonic cameras that would take a VHS cassette. View Finders were black and white and these cameras were quite bulky and designed to sit on the shoulder to stabilize the image. These were very good cameras at the time and were available to the students from the Technikon but we had to book in advance to use the camera and gear to put together a production. 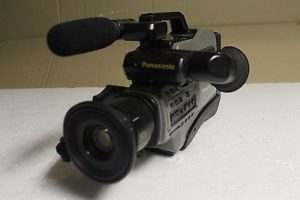 But there was a difference between this Panasonic VHS camera and a Broadcast quality camera. Today that has all changed as even cell phones can now film in True HD quality (1080i) and cameras are generally filming to memory card now. 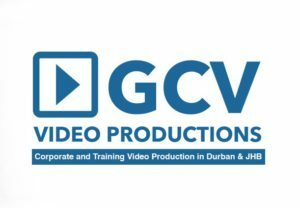 Sony HDV Z5 camera used at GCV Productions. Note the memory card recording unit. 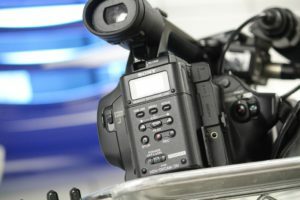 This blog is not about the technology of cameras but about how to use the camera for basic video production. So lets start by saying we don’t have any preference what camera is used provided you have access to the camera and it is able to film for a few minutes without interruption. I will give video demonstrations below. What is very important is a tripod for your camera to be placed on to keep a very steady picture (remember people…basic production here) We are looking to create a visual that is comfortable to look at and not jarring on the eye. Using a tripod is getting the basics right, however if a tripod is not available look at using something for the camera to rest on. Action shots do not necessarily require a tripod but lets talk about an interview situation or training video. 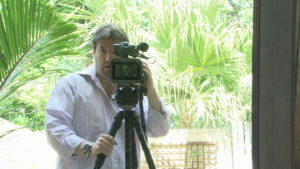 A subject professional cannot be filmed for 20 minutes while trying to keep a camera steady. It is very simple to place the camera on a tripod, press the record button and relax while the subject professional does the work. Another reason for a steady is tripod is so the camera operator is able to zoom in without the picture getting shaky. The more you zoom in the more unsteady the visual becomes. Have a look at these examples below of an interview with a tripod and an interview without a tripod. I remember back to the days at Natal Technikon studying Video Technology, the biggest issue students faced with their projects was getting sound right. We did have microphones available but it was still difficult recording good audio in difficult conditions. Lets look at our interview situation and see what is required. Most cameras out there have a built in microphone but these microphones aren’t always sufficient depending on the programme content. An interview situation will require a lapel microphone while a drama production will require a boom microphone. A journalist standing in the middle of a busy city street will need a hand held mic so although cameras do have the microphone its not always used. A lapel microphone is an awesome piece of equipment to secure good quality sound provided it is used correctly and for the right circumstances. Lapel microphones might need to be hidden completely or the actual microphone attached to the jacket lapel or shirt. lets look at a short interview with and without the lapel microphone and you will realize the importance of good sound during a video production. Lighting, like audio is generally not taken into consideration when on location. You lucky if you want to film outdoors and all that is required is natural lighting, but at times extra lighting is required on the subject. Lighting can be used to create mood but lets stick to the basics and talk about lighting as a requirement to avoid a dark picture and to be easy on the eye. Lighting today is generally LED (light emitting diode) but a few years ago and now it was called a Redhead or Blonde light, these were lights with a tungsten bulb and barndoors to direct the light. The Redhead used a 800W bulb while the Blonde was a very strong 2000W bulb and was quite often bounced off a wall or ceiling or the light was used to light a very big area. Generally anything filmed indoors requires extra light to create a visually appealing image. Provided light like a lampshade can be included in the background for creative effect but this should not be used as your light source. Lets look at an example of a video clip without and with light. Clearly you can see with the above video example what adding light to your video production offers. The light used in this production is a tungsten light with a blue gel over the light to match the white balance of the light coming through the window. Modern lights today have an adjustable switch that allows you to adjust the colour temperature of the LED. If the switch is not available then a gel is used in front of the light. The elements come together to make a quality video production. The above is the absolute basics but these basics need to be in place for an effective video production. Thank you for watching and I do hope this blog has been able to provide valuable information.